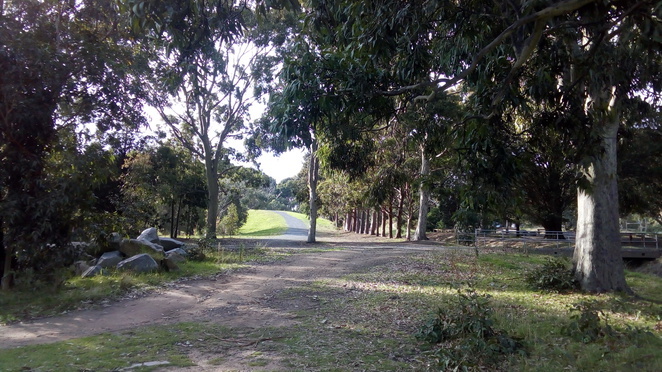 Opened to the public in late 1986, Lysterfield Park is a large park with an 82ha lake. The lake and surrounding bushland provide for a wealth of recreational activities. Aside from swimming and boating on the lake, many people enjoy walking, horse riding or simply picnicking with friends and family. However, by far one of the greatest attractions of the park is the abundance of mountain biking tracks. A rider enjoys the skills park. 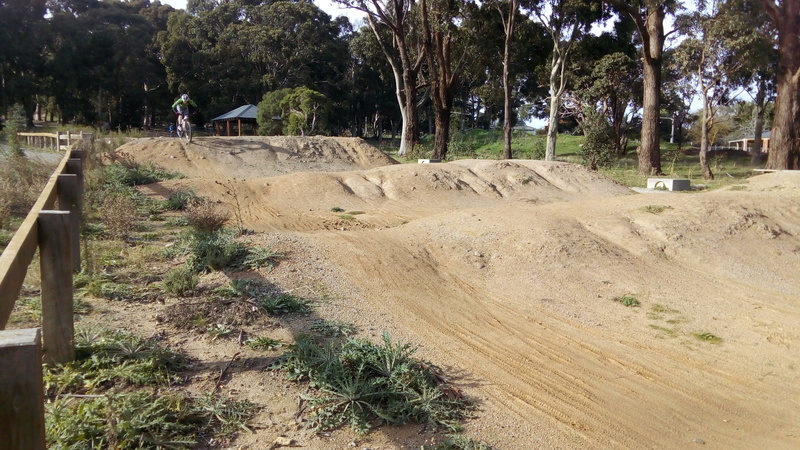 As the site of the Melbourne 2006 Commonwealth Games cross country mountain biking competition, a 6.3 km course, Lysterfield Park is well known in the mountain biking community. There are around 20km of designated mountain biking tracks around the park as well as a skills park incorporating a jumps track. Serious mountain bikers will appreciate the dedicated tracks graded to suit abilities and will enjoy both climbs and free flowing single track. The park also provides a fantastic opportunity to get children into cycling / mountain biking on the 1 km Trailmix Trail or 6.3 km Lake Circuit Track both easily accessible from the car park. Do take note that some trails, including the Lake Circuit are dual use. 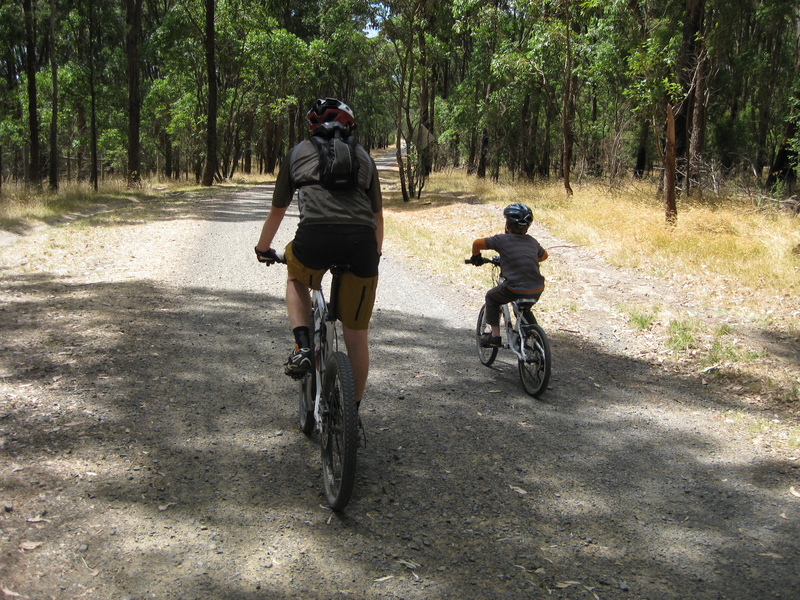 Both of these trails are graded "easy" but are on gravel and through bushland which makes for an interesting riding experience for kids who might be used to concrete bike paths. Our kids (aged 4 – 12) love the skills park. 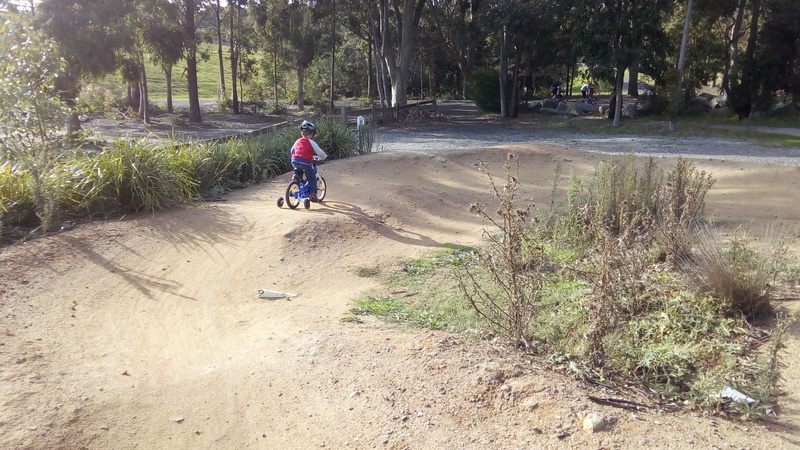 Even children using training wheels can attempt a small part of the skills track. On the day we last visited, there were two youngsters using training wheels and they were having an absolute ball (under the watchful eye of a parent). Training wheels are no barrier! The park is home to a huge amount of birdlife and if you are lucky (i.e. quiet) you can see a large number of kangaroos and on the odd occasion, echidnas. It takes roughly an hour to drive from Melbourne's CBD via either the Monash or Eastern Freeways to the access point on Horswood Rd. There is ample parking except on the hottest of days when there can be a lot of swimmers or around Christmas when large family groups tend to descend on the park for gatherings. There are toilet facilities and barbecues at the park, however at the time of writing, no cafe in operation so make sure to bring your own snacks. Mountain biking is thirsty (and hungry) work. In addition, do make sure to wear a helmet and ideally if you are venturing out on the more serious trails it is a good idea to have some basic tools (and an idea how to use them) and some basic first aid equipment. However, the park is generally very well patronised and the mountain biking fraternity are welcoming and friendly so if you do get into any difficulties, help will not be far away. We are so fortunate in Melbourne to have access to world-class facilities for mountain biking so make sure to get out there and see how wonderful it can be to cycle through the bush, without having to worry about those pesky cars. Lysterfield Park by Anna M.
Why? To enjoy Mountain Biking on dedicated tracks.